A New Testament papyrus is a copy of a portion of the New Testament made on papyrus. 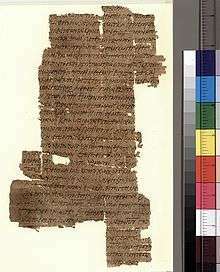 To date, over 120 such papyri are known. In general, they are considered the earliest witnesses to the original text of the New Testament. This elite status among New Testament manuscripts only began in the 20th century. The grouping was first introduced by Caspar René Gregory, who assigned papyri texts the Blackletter character followed by a superscript number. This number refers not to the age of the papyrus, but to the order in which it was registered. Before 1900, only 9 papyri manuscripts were known, and only one had been cited in a critical apparatus ( 11 by Constantin von Tischendorf). These 9 papyri were just single fragments, except for 15, which consisted of a single whole leaf. The discoveries of the twentieth century brought about the earliest known New Testament manuscript fragments. Kenyon in 1912 knew 14 papyri, Aland in his first edition of Kurzgefasste... in 1963 enumerated 76 papyri, in 1989 were known 96 papyri, and in 2008 124 papyri. As of 2015, a total of 131 papyri are known. The most important papyri are 45 (the Chester-Beatty papyrus), which contains the Gospels; 46, which contains the letters of Paul; and 47, which contains the Revelation of John. All of these date from sometime in the third century. Discoveries were also made of more complete manuscripts, which allowed scholars to examine the textual character of these early manuscripts. Not all of the manuscripts are simply New Testament texts: 59, 60, 63, 80 are texts with commentaries; 2, 3, and 44 are lectionaries; 50, 55, and 78 are talismans; and 42, 10, 12, 42, 43, 62, and 99 belong to other miscellaneous texts, such as writing scraps, glossaries, or songs. Every papyrus is cited in Nestle-Aland Novum Testamentum Graece. The P-numbers are the standard system of Gregory-Aland. Content is given to the nearest chapter; verses are sometimes listed. Thus, many of the papyri are small fragments, not whole chapters. For instance, 52 contains 5 verses out of the 40 verses in John chapter 18. Note: "Early" manuscripts are manuscripts from the fourth century or earlier. Roughly half of the papyri are "early". Some manuscripts contain content from more than one New Testament book, so the numbers above do not directly correspond to the total number of manuscripts. ↑ Kenyon, F. G., Handbook to the Textual Criticism of the New Testament, London2, 1912, p. 129. ↑ 66, 72, and 75 of the Bodmer Papyri are notable in this regard. In fact, the preservation level of 66 surprised scholars because the first 26 leaves were basically fully intact, and even the stitching of the binding remained. 1 2 3 4 New NT Papyrus Manuscripts - Peter M. Head, June 3, 2015. Aland, Kurt; Barbara Aland (1995). The Text of The New Testament: An Introduction to the Critical Editions and to the Theory and Practice of Modern Textual Criticism. Translated by Erroll F. Rhodes (2nd ed.). Grand Rapids, Michigan: William B. Eerdmans Publishing Company. ISBN 0-8028-4098-1. Law, David R. The Historical-Critical Method: A Guide for the Perplexed, Bloomsbury Publishing, 2012. Willker, Wieland. "Complete List of Greek NT Papyri" Last Update: 17 April 2008. Retrieved 23 January 2008.